Architecture firm Goettsch Partners (GP), along with Northwestern University, celebrated the formal dedication of the new Patrick G. and Shirley W. Ryan Center for the Musical Arts yesterday on the university’s Evanston, Illinois campus. The new building is located south of Pick-Staiger Concert Hall and the Regenstein Hall of Music, on the southeastern edge of campus. 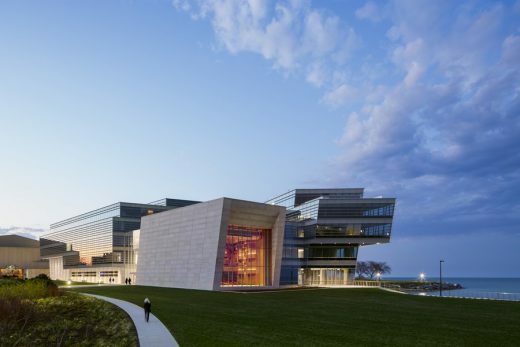 Sitting on a prime site fronting Lake Michigan and a new arts green, the building serves as a signature facility. 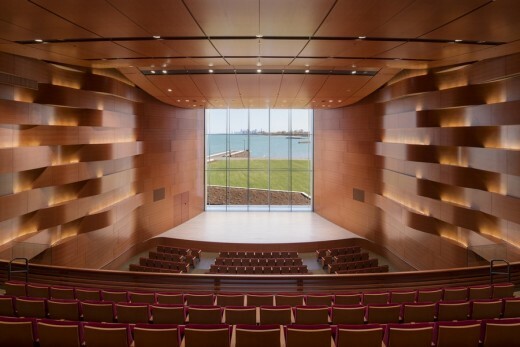 Designed to wrap and connect with Regenstein Hall, the building enables the School of Music to consolidate its programs for the first time ever. The dynamic, Z-shaped plan of the building mass defines the eastern edge of the arts green then jogs to the western edge of the lake. 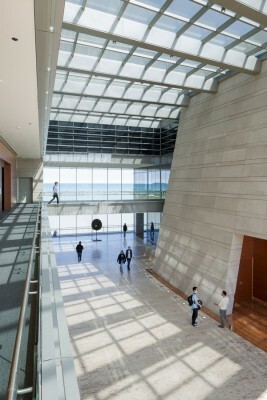 A large atrium divides this form, providing the main entry and gathering space and offering clear views of the lake. All spaces met rigorous acoustical requirements, including the opera rehearsal and choral recital rooms. The recital hall is the building’s crown jewel. Featuring a 40-foot-high glass wall, the space sets performers against a dramatic backdrop of Lake Michigan and the Chicago skyline. “The intensely collaborative process between the school and the design team throughout the project led to a building that is thoroughly conceived and developed,” added Michael F. Kaufman, AIA, LEED AP, GP managing partner for the project. The main recital hall double-skin glass wall at the back of the performance stage supports the highly sensitive acoustic performance requirements of a concert hall. 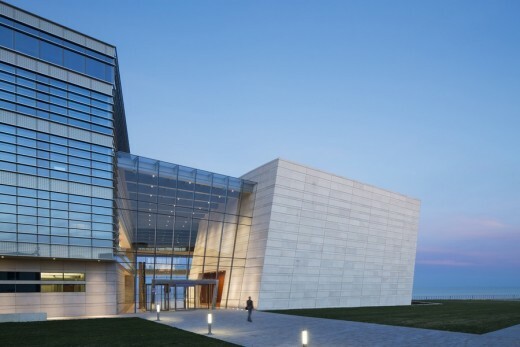 The design needed to consider the overall acoustical challenges of a monumental 42’ x 40’ glass wall and the resultant acoustical reflections within the recital hall. The vertical supports of the glass wall are hung from above and achieve their slenderness by using highly tensioned horizontal cables that are anchored to the recital hall’s massive concrete side walls. Solar/blackout shades are hidden above the ceiling, contained within the accessible cavity to avoid interfering with the acoustics of the hall. The inner glass wall is tilted inward to prevent an echo from being heard by the audience. Acoustical banners can be employed inside the recital hall to fine-tune the acoustics during a performance. The horizontal woven-wood panels are designed to absorb the sound reflections from the glass wall so that the entire room works in harmony to provide a dramatic view behind the performer without compromising acoustics. Targeted for LEED Gold status, the building offers a variety of innovative features including a double-skin facade and grey water system. 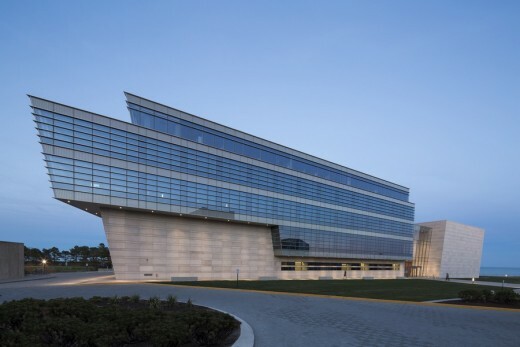 One of Northwestern University’s goals was to build a highly sustainable building that engages and invigorates the campus and larger community. The university intends to use the building as an educational tool to encourage and advance the science and knowledge of green building and operating practices.